Thanks to everyone who entered! Your answers kept me lol'ing all night long. And since I never got to enter the contest myself, here's what my answer would've been. MARGUERITE BUTLER!!1! who said, "Would I have to do something? As long as he could still take out the trash and mow the lawn, I could probably find people who didn't need their brains for him to snack on. I really hate mowing the lawn." Marguerite, I like how you think. Something similar actually crossed my mind before. I've tried to be vegan multiple times in the past, and was actually pescatarian for 5 months or so, but in the end meat always seduced me. My carnivorous craving would be instantly sated though if, instead of eating animals, I just ate dumb humans instead. Save the animals! Eat more people! So back to Marguerite: Besides having a brilliant answer, she also has a really funny blog filled with fuzzy farm animals and lolcats. You're gonna wanna follow her. Anyway, I hope you enjoy your copy of Dust! In other news, things are going smoother and smoother at work. I think I'm getting the hang of things and really learning what my boss is looking for and how she likes things done. Soon, I'll be able to finish her sentences. But that's not enough. I want to be THE best lit assistant ever and be TOTALLY in sync with her. And the only way to do that is to connect the ends of our gangly ponytails and be the six-legged horse to her blue giant. Soon we will be unstoppable. I won! I won! I won! I thank you from the bottom of my Lolz-loving heart! 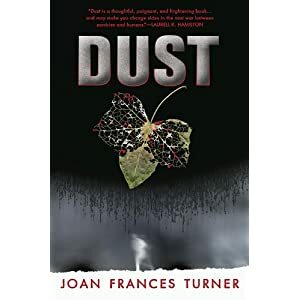 I can't wait to read DUST! I think I just expended my year's worth of exclamation points!! Jude, you lolz me to life.